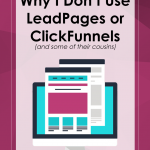 I don’t hate LeadPages or ClickFunnels. As a matter of fact, I have read (and loved) Expert Secrets and DotCom Secrets. 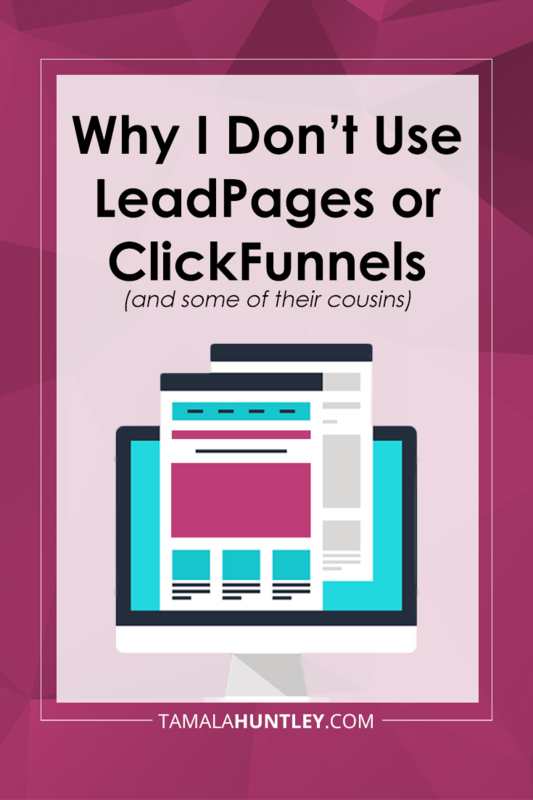 I know everybody who’s anybody pushes using LeadPages and/or ClickFunnels. There are others like Unbounce, MegaPhone, InstaPages and more. Even email marketing companies like ConvertKit offer landing pages too. Question (and possibly a bit dramatic comparison)… would you turn over the keys to your house to a stranger? You’re living dangerously when you turn over your business assets to strangers. Uh oh… you don’t look at your website and content as assets? You should though. At the most basic level, a website is just a collection of pages that allows “users” to interact with you (or it could just be 1 page). It’s a user interface to the stuff that resides “behind the page”… which at the end of the whole process = the ability to buy your products and services. That’s a major asset… how else will people buy from you or give you access to their Inboxes? I get it… using external page builders and funnel builders (a.k.a. ClickFunnels) is easy and allows you to get eyeballs on your offers quickly. if you ever fall out of love with LeadPages (or their cousins) you have to recreate everything you have with them. I mean, for them that’s great long-term “job security” but what about you? Now those may not be a big deal to you. If not, close this page and don’t read any further. And yes, I know… any site can break down… I know. However I like to stack the odds on my side. It would be much easier for me to take one of my pages on my own site and just swap out a payment button from one payment processor to another (yes, always have more than one) vs. trying to recreate entirely new pages when a page builder goes down. Now if you’re like me and it is a big deal to you then I’m gonna give you some alternatives. Also, I’m sharing plugins so you’ll need a WordPress site to use them. If you don’t have a WordPress site… you can set one up in 5 minutes and just use it for sales and landing pages. Same as what you’d be doing with LeadPages and their cousins. I’ve used these plugins on my own websites (check out my homepage and salespages like this one) and on my clients’ sites. You can see a full list of all of my favorite things here (Oprah has hers and I have mine *smile*). My absolute favorite page builder plugin is Thrive Content Builder (now Thrive Architect) plugin. It’s easy to use, they have great templates and features. If you have an eCommerce store and are using Shopify, then Zipify Pages is a great app to create landing pages. The other one is WP Profit Builder. This one, to me is a little buggy sometimes but it’s less expensive and can still make some really nice pages. Now you’re probably thinking, well Tam, if I use a plugin won’t I always have to use it too. Yep, you will. However, you only pay for them once and you keep your content on your website. No stranger danger. Now handing over your assets (content) to someone else. Now, I’m not gonna try to “convince” you to use either of these plugins. I just want you to be aware. And more than anything, I want you to own your assets. If you don’t use a plugin, you can also just get a landing page template made for your website using your current theme. I did that too for some of my email signup pages. The Epik child theme on the Genesis Framework from Studiopress (the theme I use for this website) is great for this. It comes with full width and landing page layouts that make this super easy. All you need to do is remove menu navigation and sidebars. It won’t be all fancy-shmancy but it will serve its purpose. Everybody starts somewhere. And you could easily find someone on Upwork or somewhere to do it for you, probably in an hour or less. Unless you just have a really complicated theme or design. These third-party services are not bad. I just believe they have their place. And you should know what you’re getting into before you sign up with them or anyone else. If LeadPages, ClickFunnels or one of their cousins is what you feel you need right now, by all means do what’s best for you. I encourage you to have a backup plan in case something goes wrong (which you should have anyway). Have backups of your content, your email lists… everything. And lastly, have a plan for what you will do if you decide you don’t want to pay the thousands of dollars in recurring yearly costs or for whatever reason don’t want to use the service anymore. As a business owner, being super picky about what you invest in is important. As you grow and have more business revenue, you can invest more in the tools you use, if you so choose. Sometimes there’s no way around needing third-party services. And there are risks associated with anything, whether you’re doing business online or offline. So just count your costs and be aware of what you’re getting into.